Mars Transformed | This area was a giant sand pit 2 years ago! Canoeing down Beaver Dam Brook | Will we be able to canoe through the restored wetlands? Pablo helps out | Pablo, a university student from Spain, joined the crew for a month. Keith Pulls Boom | During water harvest, cranberries are contained by a floating boom; the tightness of the boom controls the density of the berries as they are pushed to the pump. Ralph and Evan on the detrasher | As the berries come up to the detrasher, they encounter a fine high-presssure spray which separates the berries from the trash. August, 2009 | August Morning | Flip enjoys the early morning light. Beaver Dam Brook | North of the nursery. Channel Connector | I am reminded that restoration design will need to consider these channels. May, 2008 | 32 acre Greening | In later May the vine has begun to green. Spring, 2007 | Wild Iris | Signs of spring. July, 2007 | Sprinklers working on the 32 acre | Most likely, the sprinklers are be flushing out a chemical application. July, 2007 | The bees | The bees are rented for 3 weeks; they are trucked in and leave at dusk or dawn. July, 2007 | Bloom on T1 | These tiny white flowers make the bog look like it has a case of dandruff. July, 2007 | The Arm | Without the boards holding back water, this might turn out to be a vernal pool. July, 2007 | Caroline Walks the Bogs | The bees are ensconced on the mound between the 14 acre and 35 acre. October, 2007 | A Tidmarsh Landmark | Farm vehicles await next use. October, 2007 | DJ and Ralph pick the 32 acre | These pickers were designed and built by x.
October, 2007 | Ralph on 32 acre | As the discs spin, the pickers shake the berries off the vine. October, 2006 | The Harvest Party | Our friends and their children don waders. November, 2006 | November morning | These turkeys have just left the garden. October, 2006 | Berry Transport | On a single run, these trucks hauls 40,000 pounds of berries to Ocean Spray. October, 2006 | Ralph Levels Berries | Ralph distributes berries so they wont fall out of the truck. Fall, 2000 | Ricky with Alice and Carol | Ricky, Alice and Carol find a comfortable seat on a flatbed. Fall, 2000 | Clare's View | Clare is ready to help push the berries. Fall, 2000 | Girls In Berries | Tidmarsh Annual Harvest Party. Winter, 1989 | Sand Buggies on Manoevers | If enough ice forms on a winter flood, buggies are used to distribute the sand across the bogs. Winter, 1989 | Coffee Break | Coffee breaks allow the crew to warm up and share fishing stories. Winter, 1989 | Sand Buggy being Filled | Bogs are sanded every 3 years; many yards of sand are sieved each year before it gets to cold, in order to have enough sand ready to apply when the ice forms. Harvesting Weeds in Beaver Dam Brook | In order to insure Beaver Dam Brook flows freely downstream of the bogs, we use a weed harvester; this practice raised concerns by persons living around Bartlett Pond, so we developed a weed catching grate which was placed at 3A. May T1 | You can distinguish the green of the Early Blacks from the Howes. 35 and 14 acre in May | The bogs are beginning to green up. Helicopter Sanding Year 2 | Aerial of 14 acre showing the second year sand flown on by helicopter. Sand Painting | The 14 acre was half sanded when spring came. Aerial Looking east from the 35 | You get a sense of the relation of the bogs to Fresh Pond and the ocean. Restoring the Bogs | The 35 acre was in bad shape when it was purchased; all the lateral ditches needed cleaning. Cleaning Ditches | The ditches were dug out little by little, but how to get that heavy mud off the bogs? 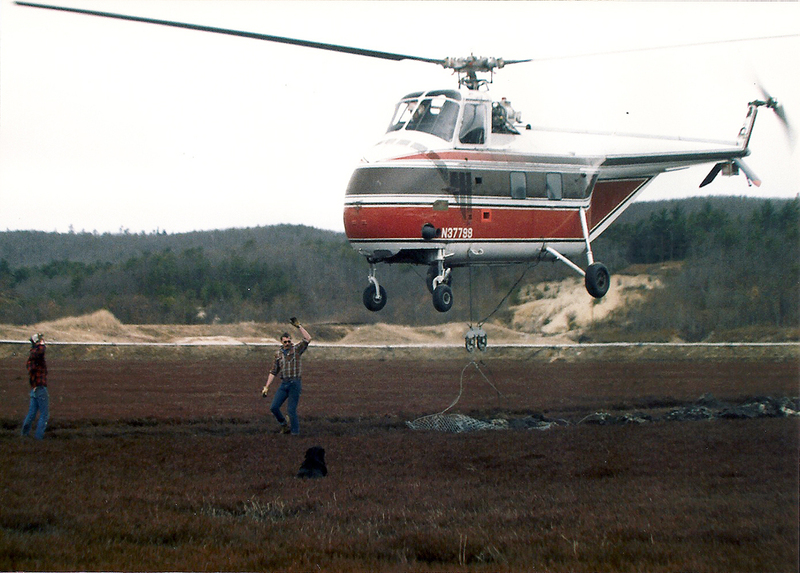 Helicopter Dumps Sand on Bog | The goal was to evenly cover the bogs with an 1.25" of sand; it took two years to sand the 14 acre. Helicopter Gets Load of Sand | The 14 and 35 acre bogs were in need of a lot of sand; the river kept the ice open, so Tidmarsh resorted to flying sand on with helicopters. 1986 | Flying off the mud | Helicopters flew the muddy mats to the uplands. 1985 | Working the conveyor | At the top of the conveyor, trash was supposed to separate from the berries. 1985 | Conveyor used in Harvest | In the early days, berries were pushed up onto a conveyor.